Learn how to make APIs with JavaScrips and Node-RED in this awesome tutorial. Below is a simple example which is the same scenario that I implemented with the API Management service. In order to reduce the number of requests from (mobile) clients two HTTP requests are invoked before the results are returned to the client. 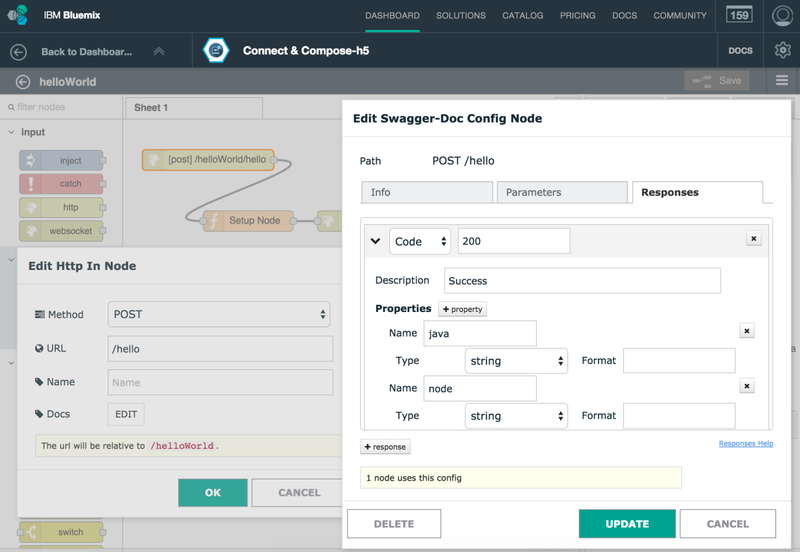 After you’ve created a service instance on Bluemix you can choose to compose new APIs. In the Node-RED editor the first thing you need is an Http In node where you define the request type and url. The Http In node is linked to a Swagger-Doc node where the input and output parameters are defined. To open the Swagger-Doc editor click on “Edit” in the HTTP In node. The last node of the flow needs to be a Http Response node which returns the data in the variable msg.payload as defined in the Swagger-Doc node. Everything else between the Http In node (with the linked Swagger-Doc node) and the Http Response node is up to you. In my simple example I simply invoke two Http get requests and put the responses together in one message. 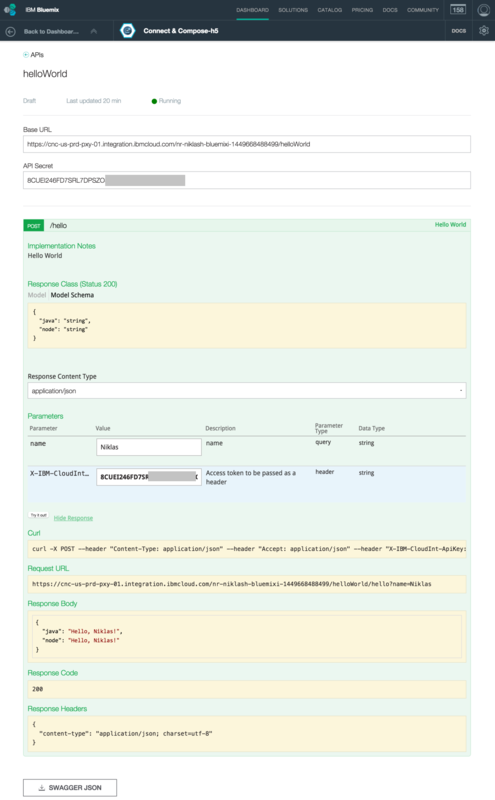 After you’ve composed the API, the Connect and Compose service provides a Swagger definition of the API and an API explorer. To allow only certain applications to invoke APIs, application keys and secrets are provided. To learn more check out the Connect and Compose documentation and the email newsletter sample.